Brace yourselves, Game of Thrones fans: A winner is coming. We’ve forged an alliance with Pyrrha to give away one of its officially licensed necklaces based on the hit HBO TV show. Handcrafted in Vancouver from reclaimed sterling silver and bronze, each talisman bears the sigil and motto of one of the noble houses of Westeros. Enter now to win your choice of House Targaryen (“Fire and Blood”), Stark (“Winter is Coming”), Baratheon (“Ours is the Fury”), Tyrell (“Growing Strong”), Lannister (“Hear Me Roar”), or Greyjoy (“We Do Not Sow”)—and try not to lose your head. 2. LEAVE A COMMENT BY MAY 20 and tell us which house is your favorite, and why. Although it doesn’t hurt to get fancy, we’ll be picking a winner at random. Note: This contest is open only to residents of the United States and Canada. We’ll announce the winner in our newsletter on Wednesday, May 21. The deadline to enter is 12 midnight ET on Tuesday, MAY 20, so ENTER NOW for a chance to win! Pyrrha designers Wade Papin and Danielle Wilmore handcraft their signature jewelry by casting 19th century wax seals into meaningful necklaces, rings, earrings, and bracelets. Each personal talisman is handcrafted from reclaimed sterling silver, bronze or 14k gold in the pair’s Vancouver studio. Rich in symbolism, each of the designs have unique meanings culled from heraldry: gryphons denoting bravery, wings symbolizing protection, and anchors signifying hope. Most recently, Pyrrha introduced the Pyrrha x Game of Thrones jewelry collection, an official collaboration with HBO. House Greyjoy, because they do not so, what is dead may never die, and they still follow the old ways. House Stark! Wolves are my spirit animal and they have taught me that Fear Cuts Deeper Than Swords, and have given me nothing but strength to fight my own battles. House Targaryeh, because dragons are cool! Northern countries are the places I feel the best in. So I chose House Stark. House Stark, of course! Because: Grey Wind, Shaggydog, Summer, Ghost & Nymeria. House Stark. I've a soft spot for the family & it so happens one of my sons has wolf collection (just pics & knick knacks ~ not actual wolves..lol) If I won I would give it to him; he's a HUGE GoT fan, as is everyone in our family! House Baratheon. Stannis is going to save us all. House Stark, i love north and all its legends, and the sense of honor of north men. House Targaryen. �Fire and Blood!� - Because I LOVE it! House Targaryen, because I love her guts! house targaryen � obvious reasons! I love white hair, I adore strong female leadership and I shudder before her fiercfulness. Because I live in Saskatchewan, Canada and Winter is always coming here, I like the Starks best. Winter is Coming. Because where i live it is always a little winter. Canada. Targaryen because who doesn't love a dragon? Stark (�Winter is Coming�), Baratheon (�Ours is the Fury�)love the look and message of them both. House Greyjoy, why? Because throwing & catching axes is rad. House Of Stark is my favourite 'cos of the fearless tomboy Arya. At such a young age, she shows her courage. House Stark, because the North never forgets. House Lannister. We are the 1%! House Tyrell, because my actual family crest is a flower and I'm tiny like Lady Olenna. Targaryen - Fire & Blood! Daenerys represents a strong, confident woman who makes the best of her situation and overcomes her obstacles with mercy and justice. The Targaryen House, of all the houses, possesses the strongest birthright, and of the Throne Contenders, Daenerys is most suited for leadership; she alone seems to genuinely care about her subjects and not just the obtainment of personal power. Lannister! I'm a Leo, and while half of the Lannisters are terrible people, the other half have turned into really great people. House of Lannister, Hear Me Roar, with the lion reminds me of Katy Perry's Hear Me Roar song. House Targaryen because I love Daenerys! She's such an awesome fierce role model! House Targaryen! Dany is the best! House Targaryen all the way! Dany is the best candidate to rule out of everyone!! House Tyrell- I love the feminine aspect of their house. House Targaryen... you can not kill a dragon with fire!! House Targaryen, because motherfucking DRAGONS. House Stark. Their loyalty and sense of honor. ..and the direwolves are just so cute! Tyrell or Greyjoy, not to be like all the dragons or wolves. House Stark is my favorite house but the Lannisters always pay their debt. House Targaryen, for the breaking of chains and Mother of Dragons. House Targaryen. Watching Daenerys rise above the victimized payment that her brother used her as, into the noble Queen and Mother of Dragons has been an adventure all in itself. It gives me motivation to climb higher and to do better. "Per Aspera Ad Astra" means "From the thorns to the stars" and that is exactly how dragons fly, and how Daenerys reigns. Targaryen, because "Fire and blood"! Tyrell. Nobody suspects the flower. Brace yourselves, Game of Thrones fans: A winner is coming. 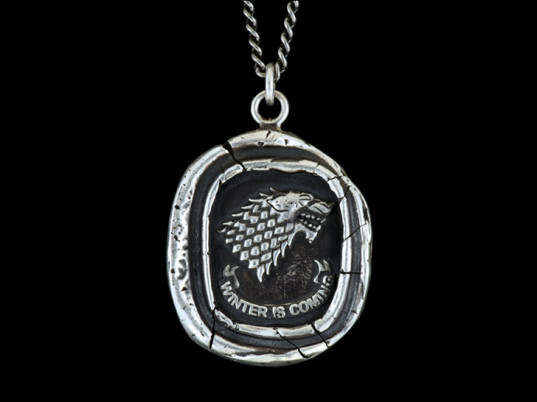 We've forged an alliance with Pyrrha to give away one of its officially licensed necklaces based on the hit HBO TV show. Handcrafted in Vancouver from reclaimed sterling silver and bronze, each talisman bears the sigil and motto of one of the noble houses of Westeros. 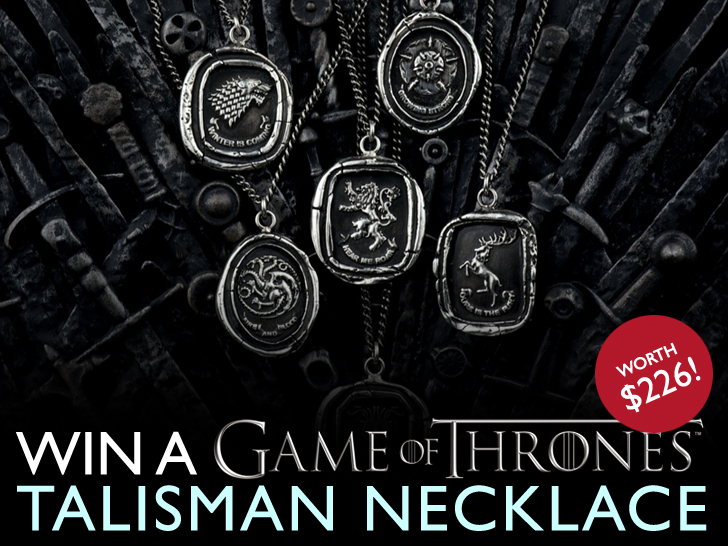 Enter now to win your choice of House Targaryen ("Fire and Blood"), Stark ("Winter is Coming"), Baratheon ("Ours is the Fury"), Tyrell ("Growing Strong"), Lannister ("Hear Me Roar"), or Greyjoy ("We Do Not Sow")�and try not to lose your head.